BAMAKO—The recent documentary We Will Rise: Michelle Obama’s Mission to Educate Girls Around the World is the latest plea from the west to meddle with African education programs. The cameras roll as US First Lady Michelle Obama and other Americans arrive on the shores of the African continent. At the airport, they hop into their Range Rovers and BMWs. From the get-go, the documentary contains all the usual stereotypes. The filmmakers focus solely on rural areas with aerial shots of worn out roofs, haggard roads and decrepit plots of land. The western gaze is fixated on poverty, access to electricity and running water, and Ebola. They point their holier-than-thou fingers at African society—to tell us how we have erred, what is wrong with our traditions, and how they come with answers to our every woe—those we have foreseen and those unbeknownst even to us. The current ideological preoccupation is education. Michelle Obama and the rest claim to be dedicated to the mission of promoting girl child education around the world. They have come to Africa with lights and cameras to approach our children, for a talk. Dozens of parents surrender their children to the US cameramen. Though I am having a hard time envisioning this the other way around—where, for instance, Nigerian or Ghanaian or Kenyan First Ladies, movie actors, and journalists come to the US and they surrender their children so that our African educationalists can speak with American children in private and impart upon them guidance and advice. Hardly imaginable, indeed. The visit to Bensonville, Nigeria is led by US news correspondent Isha Sesay, who is of Nigerian heritage. That detail is not insignificant. It aims to give the appearance that they are not foreigners trespassing but friends returning. Sesay’s European accent and bone straight weave, however, deceive her claims of Nigerian authenticity. True, there is no ideal type for an African woman, yet she sticks out as someone who is passing through, not staying the course, but who’s here to “teach” missionary enlightenment. The cameras also travel to Marrakech, Morocco to visit Muslim girls and to Marshall, Liberia to visit Africans with American first and last names, like Janet Jackson. In these places, the girls recount their struggles with education and the problems they face during their schooling. Some parents do not have enough money for their school fees, so the girls must work or sacrifice their schooling while the parents pay school fees for the boy children. Some girls feel they cannot go to school during their menstrual cycle or end up dropping out altogether. The issues they mention come as no surprise to us, as we know them dearly. 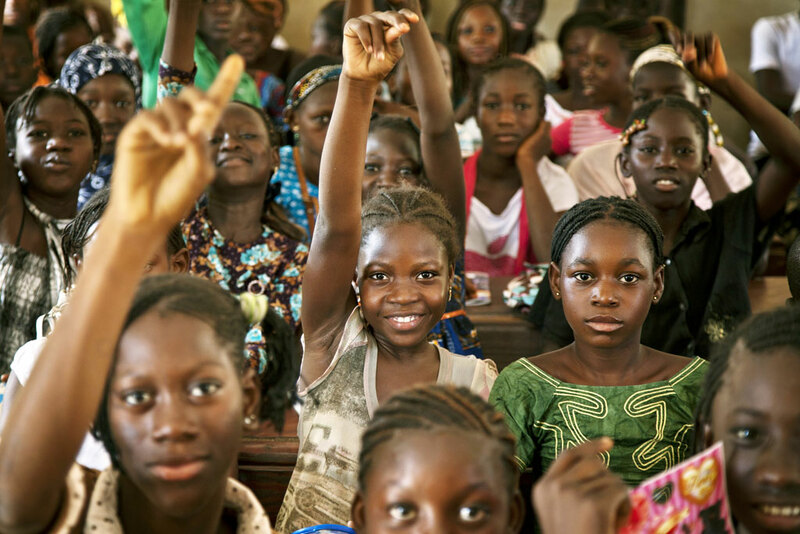 The in-your-face message is clear: remove all obstacles so that these girls can attend school. It sounds innocent enough. But circumspection is always necessary when foreigners come to your land, not to observe and worship your idols but rather to supplant them with new ones. Further suspicions are warranted due to circumstances of international relations. Michelle Obama out of sheer love for her African brothers and sisters wants our girls educated, while her husband Barack Obama as US Commander-in-Chief forms USCommand in Africa to occupy fifty-two countries with armed forces and to establish a drone base in Niger that threatens to bomb his African brothers and sisters. Somehow the math just doesn’t add up. There is a politics of school that people are missing when they unwittingly take the bait of girl child education without critically assessing its meaning. Some of the narration gives us a hint. Project Soar, a group in Morocco that is funded by the US Peace Corps, follows a mission to keep Moroccan girls in school as long as possible. So long that while they amass degrees, they miss out on their prime childbearing years during their teens and twenties. (A little known fact is that once a woman turns thirty, she only has a thirty percent chance of getting pregnant and that percentage takes a nose dive with each year after thirty.) So long that they are fixated on memorizing books they forget practicing their own traditions and cultures. So long that they absorb foreign ideologies and never construct their own perspectives. Only with a short brain (as in a brain that cannot see beyond the fence) can one take the mission of educating girls at face value. African parents, together with their governments, are blinded by the shine of long degrees and the fashion of new shoes at every month’s pay and air-conditioned offices made from actual resources from their African backyards. They forget that every act of ritualized western [missionary] education necessitates a simultaneous forgetting of African culture and value systems. Severe criticism of Africa with regard to the treatment of women and girls is undue in light of the state of women and girls in the US. In the film, Michelle Obama preaches that “the health of any nation can be measured by the health of women in that society.” This statement unwittingly boomerangs back to her nation where African American women have increasingly been imprisoned at alarming rates, where women are paid much less than men for the same work, and where only thirteen percent of women have any form of paid maternity leave after childbirth. Nonetheless, the nation hypocritically trumpets gender equality, for example, to claim that women having paid maternity leave is unfair to men. Mind you, no civilized nation would deny women that basic right. Therefore, if the health of the nation in Michelle Obama’s land is measured by the treatment of women, certainly the nation’s diagnosis is hovering in critical condition. On the subject of education, the conditions of public schools in the US have been deteriorating for decades. Under Barack and Michelle Obama, under Mr. and Mrs. US Command in Africa, waves of public schools in the US have shut down in eight years of pure decimation. Especially in inner cities like New Orleans, Louisiana, parents complain that their children are forced to attend failing community schools or else drive hours to decent schools. What about those girls in the US whose education is piss poor because of a system that fails them? Moreover, in the US, school has evolved into a money-making enterprise meant to entrap unsuspecting young people in mounds of debt with compounding interest unable to be shirked with bankruptcy laws. It is shocking that Michelle Obama and her entourage would fly all the way to Africa with this mission of girl child education when the schools in the US are seriously in need of her help. The sheer pharisaism is stinging. Yet, it seems impossible to ask outsiders who come to Africa to “teach” us the way, to go back and focus inward on themselves when their existence depends upon their parasitic terrorization, infiltration and exploitation of our communities. It is difficult to make US politicians understand the poverty, the worn out roofs, the haggard roads and the decrepit plots in their own country when their ideology of American Exceptionalism depends on their not understanding it. So, instead of kneel in pity before those who bring drones, occupation, and surveillance, I beckon us all on the continent to examine ourselves and come up with our own praises and remedies, to ration our own self-love and self-improvement. In traditional Africa, women and men are not amorphous beings who float throughout the universe in random fashion. Women and men have roles. These roles have propelled African cultures through thousands of years of civilization. These roles are integral to the functioning of society. The breakdown of roles is what leads to the collapsing of societies, the losing millions of species, the scorching of the earth, avalanching down the path to ecocide. We have fond respect and care for Mother Earth, in part, because African societies view women as sacred. In many ways, women and girls hold and keep the traditions of a culture, for instance, through preservation of recipes and customs. Women also instill in their children the values and traditions they would like to see passed on to future generations. The prevailing ideology perpetuated by western scholars of African History that African women were privately, publicly and socially viewed as inferior to men, is simply not true! There are several examples that go back as far as 5,000 years to illustrate the simple, yet overlooked point. Nubian women, for instance, enjoyed a great deal of legal and financial independence. They could buy and sell property, serve on juries, make wills and even enter into legal contracts. Kemetian women, too, when they worked outside the home received equal pay for doing the same jobs as men. Unlike ancient Greece (where most of Europe claim they now derive their civilization), the women were effectively owned by their husbands. During colonialism, this history was distorted. Instead of allowing it to evolve organically, colonialist sought rather to erase every memory of it. Mission school under the guise of education was the tool used to take young and impressionable children away from their families, to indoctrinate them and turn them against their parents and grandparents. It is no wonder that traditional people are still skeptical of this notion of foreigners discussing their children’s education, much less suggesting to uproot their children from the home and into mission schools. The obsessive focus on promoting girl child education around the world serves other interests besides encouraging learning. When you take Muslim and African women away from their homes and keep them away as long as you can, it reduces their birth rates on that fast-growing continent. It serves the bottom line for the global elite more economic participation in the labor force means more hands on deck for the capitalists. Most detrimental, it allows them to forget their traditions. It also breaks up families. Give women a salary, pay the men less or keep the men unemployed and underemployed and out comes a new culture of women who find immense pride in their schooling and high-powered professions, while they disrespect their underperforming men. In a short couple of generations, we’ll have a world of single ladies and independent women who can do bad all by themselves with no need to sustain a household. Sadly, what is great for individuals is utterly horrible for communities! I tire of western documentaries focused on Africa’s problems. I tire of western ideologies (especially western feminisms) purporting to fit Africa into an alien box. Any and all issues with education or other matters big and small can be addressed by our communities. If our girls need sanitary napkins or money to afford school, we shouldn’t have to ask the International Monetary Fund for permission to have the government make basic schooling free—or more affordable—so that all children can attend. We shouldn’t have to beg a foreign body to have our government provide sanitary napkins for girls, so they do not miss school because of their menstrual cycle. We must also reflect upon what we seek when we desire for our boys and girls to attend school. Is the school important or is it the education? If the latter, why can’t we devise a system that does not uproot our children from their local communities but brings education to them—to the farms, to the villages—in their local languages? Why does school have to be miles and miles away from the people and their traditions? Girl child education in and of itself is a worthy endeavor. On the other hand, uprooting girls from their communities for decades so that they miss their prime reproductive years and look down upon having a family is unproductive for our culture and posterity. African solutions have always trumped neocolonial ones. The new western paradigm shift for a parochial focus on girl child education is the wrong approach to solving an African problem. The path to an African ideal lies in a holistic approach to education in which our culture and traditions are respected—not in a provincial western ideology. Previous articlePlagiarising Obama – Who Wants to Write for President Buhari? Girl child education is key in much the same way as the education of boys. But when the focus on girls alone comes from the U.S., it is no secret that critics remain skeptical. Amara Jali remains an astute and incredulous observer. She asks: What kind of education? From whom? For what— U.S. multinational corporations? Putting these into perspective against the backdrop of the minatory drone base in Niger, newly built by Barack Obama’s Administration, for African surveillance, together with the evolving terrain of U.S. Military bases in all African nations except two, and circling these two back to the promise of a western NGO-led girl child education, driven by Michelle Obama, one is left with nothing but acute suspicion. Indeed, as Amara presents the issue, the confluence of girl child education and U.S. military occupation in Africa is a torsade of a great idea betwixt a disturbing presence. The torsion that such a nervous combination generates within African policy ideals raises serious questions about the place of boys in our collective imagination of nationhood—and determining the place for self-assertive manhood. Imagine African nations with ebullient feminisms, yet stuck under the macho-terrorism of western military manhood? What future is that? What future are we building, or rather, sheepishly accepting? These are about Amara Jali’s concerns. This is what I can say. Africa as a whole is marching sheepishly towards U.S. total occupation in the same way that the white Police Departments in the U.S. have basically become occupying forces in African American neighborhoods. Soon, in Africa, like in the U.S., when our men can no longer afford to become gainfully employed, they will be arrested, thrown in jail, and forever disenfranchised for petty crimes. The U.S. military is here to train our Police Departments and to help these Departments to strictly enforce the law. And like in the U.S., the women will do well. They will have long degrees and okay jobs in multinational corporations. Soon, the basic family unit of Africa will be torn apart – educated women and a bunch of men dominated by an occupying military manhood from America. And that’s it! Period. That’s all they need to completely dominate this continent without question! Forever! We have willingly given our continent away. How do we take it back? The average African is and has for the longest time been far more interested in Westernizing themselves than reorienting themselves to Home and strengthening what positives it holds. Africa has more than her fair share of woes but really it is not all doom and gloom if we put on the right spectacles. Thanks for nudge. Let those who have ears hear. Verily, Home has more to offer than the doom and gloom it has been made out to be by our west-seeking elite! Dade Afre Akufu, I have always maintained that if Africans, especially Ghanaians wish to truly understand white Americans who come here bearing “gifts” or the Blackfaced whites who follow them here, they need only travel to the United States for a few days! They will learn the true character of the nature of the deals they sign with these people. But my advice often falls on deaf ears. I am glad that Amara Jali, and Akosua M. Abeka’s intro, capture the essence of this laboratory in understanding what it is that they bring here to call Girl Child Education. Why not just Child Education? No! Girl child education is what they want. It is what they need to carefully refashion, redesign, the social and cultural fabric of African society. With this, they can wipe out the whole culture in two generations alone. That means the traditional and cultural frames of reference vanish and there will be no means to self-identify in any effort towards nation building. Obviously, this is what the globalists want. This is what neoliberalism is all about. An undue focus on girl child education in cultures more advanced than western culture, while other girls already downtrodden by the machines of capitalism in the very West, wallow in poverty and die off. When the true essence of the nature of these NGO machinations in Africa are unearthed, there’s only the thirst to send the masses of African women to the slaughter, albeit through the tale and ephemeral experience of a better “working” life at the expense of those “oppressive” African men. When in fact, the oppressor is not by any means the African man. It is the very West! You only need take a cursory look around to see it. The multinational corporations, the drones, the drone station in Niger, AFRICOM (USCOMMAND in Africa), the IMF, the World Bank, UN, etc. You just only need to look around. In this day it is difficult to have an honest discussion about men and women and what we both can and will contribute in preserving and improving our cultures. I appreciate Amara’s essay because it opens the door to that conversation. Nobody is going as far to say that some woman belongs to some man’s bedroom and other room. That’s just ludicrous. Yet, it is a problem when people view family tradition as a burden to be unloaded. If we all leave the village soon there will be no village left. Too bad so many people don’t know what that means because those stories and that history is already alien having grown up in cities or foreign countries. The way this feminism is blindly marching Africa, sheepishly as Dade says, into the lions den–by splitting up men and women and painting a picture of oppressive African men while downplaying the real oppression that is a foreign military occupying force, as Solomon Amara mentions–is worrisome. But it seems everyone is so busy writing exams that no one even notices. There’s no doubt that the most educated group in the US should only sit and vote. They need to take on the task of transforming their own communities, especially in an era where Black men are the target of mass incarceration. A very interesting perspective! Lol. I am starting to feel like the opposite is true: “The surest way to keep people down is to educate the women and neglect the men. If you educate a woman you simply educate an individual, but if you educate a man, you educate a whole community.” We need only take a cursory look at the African American communities to see how this is playing out. And history pretty much supports my assertion. But I invite debate. Yeah, I agree that Mass Incarceration is a huge problem. But guess who has sat around for their boys to be incarcerated? Highly educated women. The last I checked, many Black women were getting law degrees in America. For fifteen years I read this has been the trend. But how has this translated into community building? Aren’t women the ones who build community? But no. The African American community is much poorer today in relative terms (an relative has everything to do with power) than even 50 years ago. For the past few decades, the neoliberals have concentrated on Girl Child Education at the expense of the boy. And our women continue to support this trend because it puts consumer power on their tables. Fine. I like it too. I grew up in a home where my mother had money. But she became a market woman and woman of means at 34. She had 3 children before then. After that she never had single child although before she became a woman of means she had planned to have five kids. Female education at the expense of boys has been shown to only breed Single Women, Feminists and Women who don’t want to have kids. Mind you, having kids who can grow up in a wealthy home is the key to building community. Which is what men do. and did for millenia. But these educated women are barely having any kids. I get it. They claim the men are no good. Sure. I can agree. Partly because Mass Incarceration hurt these men. But back then when men were the most educated, you never heard men say our Women are no good, no matter how uneducated, poor, that those women were. This I think is key. And this is why Kwegyir may be wrong. I see. What might be the optimum approach? Certainly one can look through the history books and find many abusive men and men who have abused their power at the untoward expense of mothers. Sure, so I think Girl Child education is key. We certainly must have it. But it cannot be said to be more important than Boy Child Education. The source of power for every community lies in the Motherhood of the nation. The more prepared the women are, the more supportive they can become to their children. Men must certainly have education. They must certainly be brought up to be gainfully employed so they can have and support their families. What else do men do but to go out and bring in to their families? But then again, men fight. We fight to ensure the mothers and the children remain protected from harm. The better educated our men, the better for everyone, including our women. On the contrary, the better educated our women, especially at the expense of our men, the more Single Ladies we get. Lol. Ok. Mind-boggling but a fair point. On second thought, Dade Afre Akufu I think that it would have been more helpful to study the rise of the Black Women educated class amidst a thriving Black Man atmosphere. I think Grace Ayensu Danquah has a key point here. In that, without Mass Incarceration, that is, the oppression of Black men by white men, perhaps the Single Ladies thing would not have become so pronounced. Here I think Mass Incarceration, which has left many Black men not suitable for marriage or to have families with is a key perturbation within the smooth flow of highly empowered women for a given community of high achieving men. I get this point Akosua M. Abeka although I am not so sure if Black men would have stayed single and childless only because their women have prison records. Dade Afre Akufu, I think you’ll be hard-pressed to find a highly educated man who’s seeking a woman, without a high school diploma and who has a prison record – as few as that may be. Further, if you cordon off the African American community from the rest of the American community that oppresses it, your observations are prominent and present a troubling understanding. That said, if you were to examine the bulk of the American community and note how white men (cops, lawyers, judges, politicians and lawmakers) continue to prey on the African American community, one can deduce that the source of the distress in the Black neighborhood is perhaps not the concomitant effects of Single-Ladyship as a result of giving girls higher and higher education. Perhaps it’s the very imposition of white manhood on the African American community. That you have Single Ladies, and Ladies who “refuse” to have kids is not the result of the machinations of a sovereign Black community. When Black women obtain an education, they get this from schools run by white men. When Black women obtain employment and thus become high consumers, they get this from white firms or firms run by white men. At every turn in this equation of what has happened to the Black community in terms of the rise of the educated Black woman, or the Independent Black woman, it seems that more and more, the issue has to do more with the meddling in Black affairs by white MEN! For good or bad. You take this factor away, and I can assure you that the situation might be different. You probably would never have had a proliferation of Single Ladies, as you call it. I have to concede this point. I think it is very fair. Your post history indicates you live in America (unless you show a double standard of talking about a society you don’t actually know about, as you accuse Adichie) and you centre AA Africaness in your posts. But it’s only when it comes to writing about Adichie, who seems to have you pressed, that suddenly you generalise African problems and cultures and dismiss her as being too westernised, when you are clearly somewhat westernised yourself. Btw, I doubt you know too much about Igbo recipe traditions because if you did you would have credited us for our badass egusi soup rather than jollof, a dish that is not native to Igbo people and is believed to in fact be the culinary masterpiece of the Wolof people originally. You clearly have no problem in counting the diaspora as Africans so you can’t be so simple that you do not see that African women of the diaspora who’s beliefs and experiences align with Adichie’s deserve a voice too. In fact I have spoken to Nigerian, Zambian and Ugandan women born and raised in their countries that think similarly to Adichie and have had experiences of sexism. Maybe they are city women. And so what? The rural African woman represents the majority of African women, NOT the totality. African women in African cities and in the diaspora are allowed to be represented too. We need a platform for more African women from rural areas to speak too to show the diversity of what African women go through and to stop other people from speaking on their behalf, other people including you too. Creating more platforms for African women is the key, not sneering at the ones that don’t suit your personal ideals for Africa.